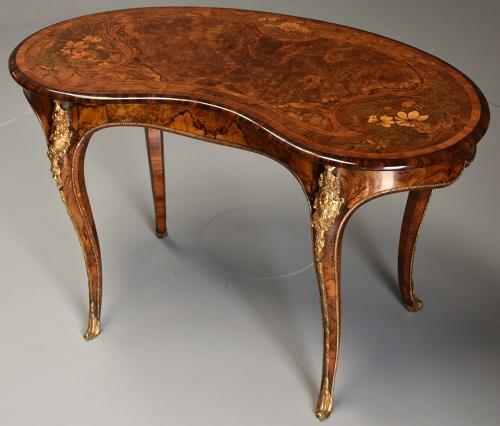 This wonderful table consists of a kidney shaped top with superbly figured burr walnut mirror veneered shaped central panel with boxwood & Kingwood banding. The outer banding veneered in burr walnut leading to a section of superbly inlaid floral marquetry consisting of various stained woods leading to an outer boxwood & Kingwood crossbanding with a moulded Albuera wood (Goncalvo alves) edge. This leads down to a secret frieze drawer to the front, this being mahogany lined, the frieze veneered in burr walnut. The elegant cabriole legs having fine quality ormolu cherub head and floral mounts with fine quality applied ormolu mouldings to the the frieze and legs, the legs terminating with ormolu sabots. This table is a versatile piece as it could be used as a writing table, occasional table or even a ladies dressing table. This table is in excellent condition, is of stable construction and can go straight into a home.